Published 7 December 2018 – Order your copy today! We are delighted to announce the publication of the 73rd edition of WRTH. For full details of WRTH 2019 and to order a copy please visit our website at www.wrth.com where you can also order the B18 WRTH Bargraph Frequency Guide on CD and Download. WRTH 2019 is also available for pre-order, for readers in the USA, from Amazon.com or Universal Radio in Ohio. This entry was posted in AM, Books, FM, Mediumwave, New Products, News, Schedules, Schedules and Frequencies, Shortwave Radio and tagged World Radio and TV Handbook, WRTH, WRTH 2019 on December 11, 2018 by Thomas. This update contains changes, additions and frequency cancellations; new stations that have become active since WRTH was published; and the revised full schedules of certain stations. We hope you find this file useful as an addition to WRTH (it is formatted in the same manner as the printed WRTH), or it can be used on its own, of course. Please forward this information to your various mailing lists and reflectors and to anyone else who may be interested. This entry was posted in Broadcasters, International Broadcasting, News, Schedules and Frequencies, Shortwave Radio and tagged B17 Schedule, Sean Gilbert, World Radio and TV Handbook, WRTH on January 31, 2018 by Thomas. Always nice to see another WRTH arrive, even though I haven’t actually bought one for many years. Attached is a pic of the very first one I bought, back in 1980. I only got it as it contained a review of the then spanking-new Trio R-1000 HF receiver, which I was thinking of splurging my meagre wages on. On the basis of that review, I went ahead with the purchase and discovered it was a cracking RX and I only sold it on in the early 90’s to enable the purchase of an ICOM R-7000, another cracker! Merry Christmas to you and all listeners everywhere. Thank you for sharing your memories with us, Andy, and Merry Christmas to you! This entry was posted in News, Nostalgia, Radio History and tagged Kenwood R-1000, Nostalgia, Radio Nostalgia, World Radio and TV Handbook, WRTH, WRTH 1980 on December 24, 2017 by Thomas. 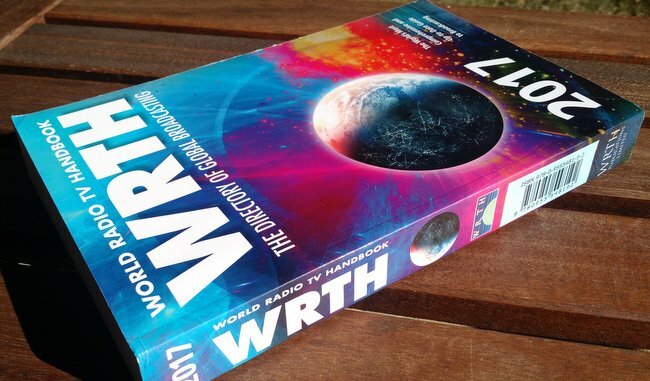 I received my copy of the 2018 World Radio and TV Handbook (WRTH) directly from the publisher yesterday, just prior to my Christmas holiday travels. As I mention every year, I look forward to receiving this excellent staple radio reference guide–and this is their 72nd edition! The first article always features a WRTH contributor: this year, they feature Torgeir Woxen who is the contributor for Norway and editor of the Asia & Pacific frequency list. Reading about how Woxen became interested in radio and DXing reminds me of how I–and many of my radio friends–got their start as well. This year, WRTH begins with a review of the Icom IC-R8600 wideband tabletop SDR receiver. They also review the Tecsun PL-880, Tecsun S-8800, Expert Electronics ColibriNano, SDRplay RSP2, and the new AOR AR-DV10 wideband handheld. Besides radio reviews, WRTH also includes an evaluation of the Cross Country Wireless Active Loop. I must admit: the Cross Country sounds like an effective and affordable portable mag loop antenna. I might need to grab one in the future to use on impromptu travels and DXpeditions. The following article features WRTH contributor, Brian Clark, and his travels from New Zealand to the geographic antipodes of his home: Spain, Portugal and Morocco. Of course, enjoying diverse radio broadcasts was an integral part of his journey! I was pleased to find that the following feature article, entitled Receiving Noise, explores the radio interference that plagues our hobby. The article mentions several common sources of noise and some of the antennas that most effectively mitigate RFI. Sadly, radio noise/interference is an important topic for most radio enthusiasts. Following this, WRTH writer, Hans Johnson, features an article on Radio Romania International. RRI is one of my favorite shortwave broadcasters, so this was a treat to find indeed–Johnson’s piece sheds light on the past, present and future of the station. Next, in A New Voice of Hope in the Middle East, Founder and President of the Strategic Communications Group, John Taylor, writes about setting up a new mediumwave station in Israel. The following article features Dr. Martin Hadlaw, a former advisor to the Solomon Islands Broadcasting Corporation (SIBC), who explores the history of broadcasting in the South Seas. Next, WRTH feature their Digital Update which assesses the state of digital broadcasting and–this year a special note about–Digital Radio Mondiale. The final article–a tradition–is the WRTH HF propagation report/forecast by Ulf-Peter Hoppe. Always an informative read and this year he ends on a positive note despite the fact we’ve hit the solar rock-bottom! The 72nd is another fantastic edition of the World Radio TV Handbook. As I say every year, I’ve never been disappointed with WRTH. Their publishing standards are such that the quality of their reviews, their writing, and (most importantly) their broadcast listings are simply unparalleled. My WRTH 2018 and Digitech AR-1780 fit perfectly in my Red Oxx Lil Roy and are ready for holiday road travel and radio fun! Purchase your copy of WRTH 2018 directly from WRTH’s publishers, or from a distributor like Universal Radio (US) and Amazon.com (US), Radio HF (Canada), or BookDepository.com (International). This entry was posted in AM, Books, Broadcasters, DX, International Broadcasting, Mediumwave, News, Schedules and Frequencies, Shortwave Radio and tagged World Radio and TV Handbook, WRTH, WRTH 2018 on December 23, 2017 by Thomas. WRTH A17 Broadcasting Schedules Update file is now available for free download from www.wrth.com. The PDF file contains the changes to the transmission schedules of International and Clandestine/Target broadcasters. This entry was posted in News, Schedules and Frequencies, Shortwave Radio and tagged A17, A17 Schedule, Sean Gilbert, World Radio and TV Handbook, WRTH on July 1, 2017 by Thomas.